An immaculately restored or original Triumph TR6 is a stunning looking car, and they are easily my favorite vehicle in the TR range. Sadly, this TR6 is not immaculate, and it’s going to take some work to get it to that state. This is another one of those projects that has managed to stall before it actually started. 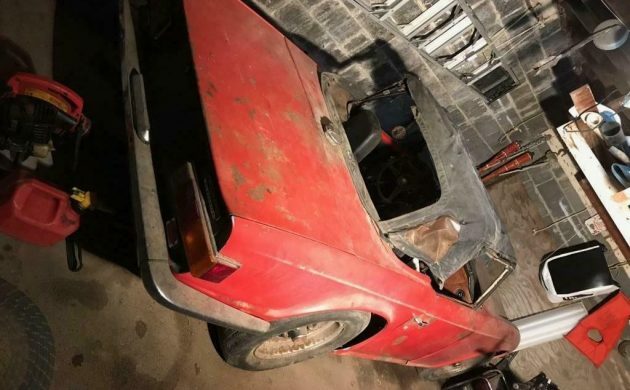 If you would like to not only start on this project but to see it through to completion, then you will find this TR6 located in Shelter Island, New York, and listed for sale here on eBay. If you dig below that faded and ruined paint, the TR6 looks remarkably solid. There are a few minor rust spots and some surface corrosion, but it looks encouraging. What we can see of the quarter panels looks good, as do the rockers. The owner says that the floors are all rusty, which is not particularly surprising. However, one of the great warning signs for structural problems on a TR6 is inconsistent panels gaps, and these don’t look bad. 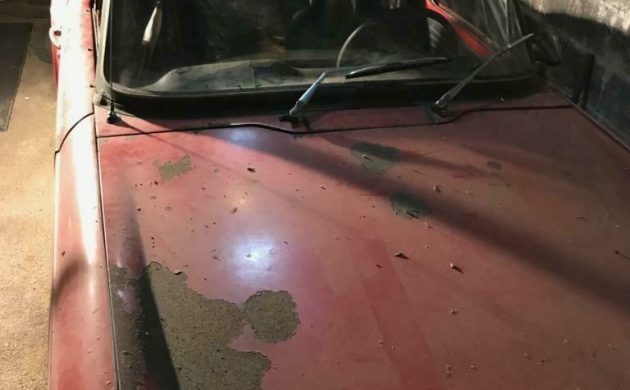 I also don’t think that the car is wearing its original color, as there are a few indications around the vehicle that it may have started life painted white. The interior looks to be complete, well, at least as best that we can tell from the only photograph of it. 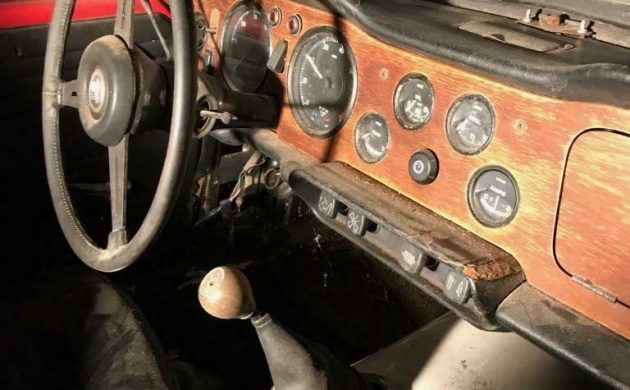 The timber on the dash looks like it is still reasonable enough that it could be restored, while it looks like the rest of the trim is also present. The soft-top is definitely only good for scrap, and it doesn’t look like there’s any carpet. 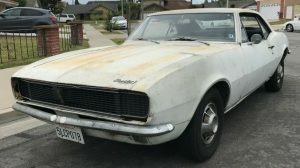 There are also no photos of the engine, but the owner is under the impression that the 2.5-liter straight-six engine has undergone a rebuild. It doesn’t currently run, but it does turn freely. One real plus is the fact that this TR6 is fitted with the manual transmission with the optional electric overdrive. While it may need a full restoration, if the frame is solid, then this TR6 would represent a solid restoration project. 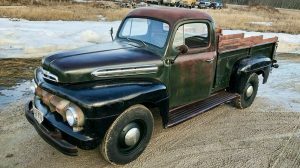 One of its greatest strengths is the fact that it is not a particularly complex vehicle, and the vast majority of the main restoration tasks can be tackled by a competent person in a home workshop. For a car of this age, spare parts are also surprisingly easy to find. 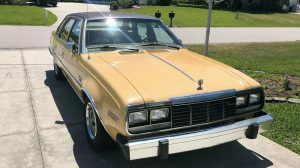 It is possible to buy a reasonable example for around the $13,000 mark, but a really immaculate example will cost up to three times that figure. 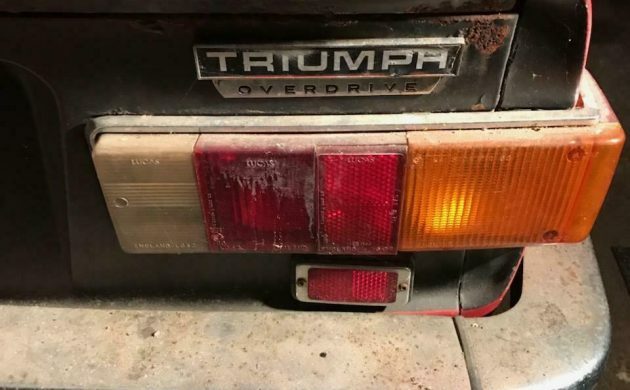 If this TR6 is solid, then with a BIN price of $3,850, or the option to make an offer, it really could be a great project. sorry, the ebay ad states it needs floors and a trunk pan. Doubt the frame is sound at this point. There’s a reason why the project stalled as solid cars are easy enough to get going as these have robust mechanicals Still, if a big project is what you want, a factory O/D car is the best start…something like 10-12% of the cars came from the factory with it. Agree with you, TR5! 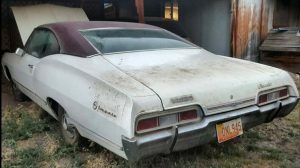 If the seller states “needs floor pans and trunk pan rockers look good, body looks good needs some alignment done on door and fender area” you had better believe this thing could easily fold in two–given a good tug with the tow vehicle, winch or rollback. I’ve had it happen with a Spitfire. New Yawk vehicle. Great cars when restored, lots of get up and go, nice body lines and easy to work on. I have owned one since 1980, backyard mechanic can do all repairs and rebuilds. Replacement parts are easy to find but the prices for those parts can get expensive. Love the sound of the exhaust……..come on summer. Too far gone, would not be worth what it costs to fix and then paint it. Better ones out there for less then the total costs. I am literally giving away a better TR6 than this (already taken, just not delivered yet). If it was a Porsche no one would think twice. Eventually we will be kicking ourselves for passing up these at this price. It happened to E-types of which I’ve had 3 over the years and only 12 years ago. I also had my share of 356 and 911 being a fanatic 60s/70s euro sports car guy. So…..I now own a TR4 and TR6. There’s really no reason why these cars shouldn’t become the next craze as they are fun, simple and have racing provenance. TR4 dominated seabring for years.